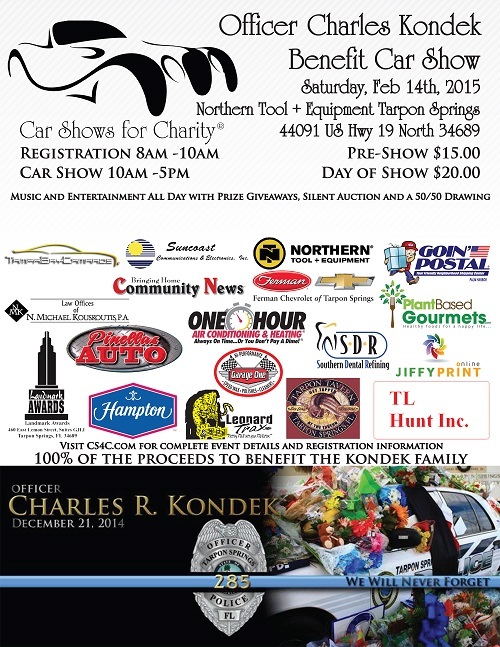 We are 8 days from the Officer Kondek benefit show! A huge thank you to all of our AMAIZNG sponsors and volunteers for helping us to get this event put together so quickly! Be sure to get those registrations in by Thursday 2/12 for pre-registration $15! This is an event you are not going to want to miss! This show is open to all makes, all models, all years; with 100% of the proceeds to benefit the family of Officer Charlie Kondek. We’ll have music, a 50/50 raffle, vendors, a silent auction and much more. Please come out and help us raise money for this family and show them how much his service to Tarpon Springs was appreciated! !